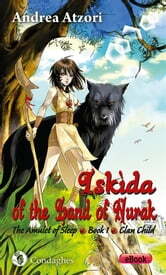 Iskìda is a young heroine in a “prehistoric” world of war and magic, inspired by Sardinian and Mediterranean folklore. She is a sorceress, wild and independent, brave and pure-hearted. She is a Dream Walker, a special kind of witch who – through dreams – must explore different worlds in order to save the threatened one in which she lives: Nurak, an ancient land of Gods and Giants. Beautifully illustrated by Dany&Dany, this is an action-packed fantasy adventure in a wholly-realised world of magic, clans and powerful dreams. “Clan Child” is Book One of the three which make up the First Season “The Amulet of Sleep” of the fantasy saga "Iskìda of the Land of Nurak".